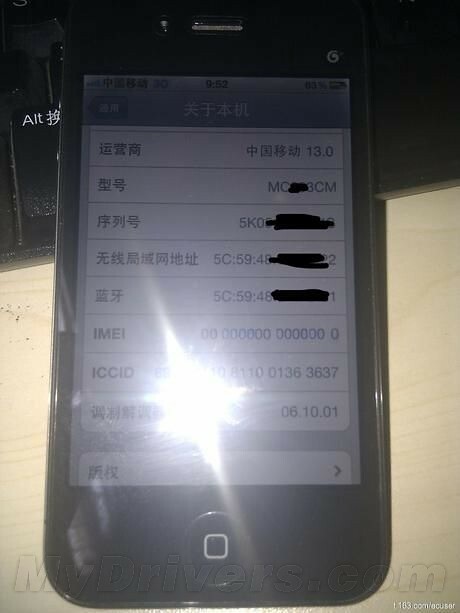 iP3: Leaked Photo Shows iPhone 5 Running on China Mobile? Leaked Photo Shows iPhone 5 Running on China Mobile? A photo has been leaked online which claims to show a next generation iPhone running on China Mobile's 3G TD-SCDMA network, reports AppleInsider. Several Chinese-character news websites, including sohu.com (translation) and mydrivers.com (translation), re-printed the unauthenticated photo, which depicts a device resembling an iPhone 4 with China Mobile's 3G logo printed in the upper right corner and running an unreleased version of Apple's baseband software carrying version number 06.10.01. The handset also lacks an IMEI number, which the reports suggest is an indication that the device represents an evaluation model. Brian White, an analyst for Ticonderoga Securities, says that a China Mobile iPhone could "represent a watershed for Apple" giving the company access to 611 million wireless subscribers and 68% of China's wireless market. "Over the past several months, we have written about China Mobile's mysterious relationship with Apple that has allowed the company to support iPhone subscribers on its network without an official carrier agreement," he wrote. "For example, we have written about China Mobile's iPhone 4 SIM card cutting service, followed by the sale of a mini SIM card and then the retail sale of the iPhone 4 at a few select locations." Last month a photo of Tim Cook was taken in the lobby of China Mobile’s Headquarters and recently China Mobile Chairman Wang Jianzhou said that they'd reached a consensus with Apple on the use of their fourth generation technology in iPhones.